SDC Technical Diving Sierra Diving Center, Reno's leading SCUBA Instruction and diving center and gateway to Lake Tahoe's great technical diving. The course includes all training and certification costs. Required books, required minimum equipment and gas are additional. Rentals available. Prerequisite: PADI Advanced Diver, Rescue Diver, Enriched Air Diver, Deep Diver or equivalent. 100 logged dives. 20 Enriched Air dives. 25 dives deeper than 60 feet. 15 dives deeper than 100 feet. The course is interactive with lots of hands on practice and workshops and 12 dives. At the end of the course You'll be prepared! The DSAT Trimix Course will provide you the training required to competently and safely utilize breathing gases containing helium for dives that require staged decompression. During the course you will learn about the benefits, hazards, proper procedures and equipment utilized in making oxygen/helium/nitrogen mixture dives. 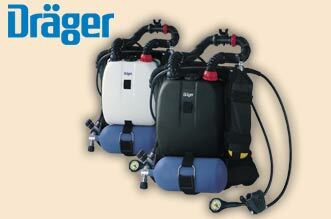 You will make 9 open water dives using trimix and nitrox/oxygen decompression gases. This course can qualify you to a maximum depth of 245 fsw. Group of 2 or more $1700.00 per diver. Prerequisite: DSAT Tec Deep Diver or qualifying, 100 logged open water dives. Course is limited to 3 divers. This course is designed to train you in the benefits, hazards, proper procedures and equipment for utilizing EANx 21 through 100% oxygen. You'll learn and practice using these optimal mixes for making no decompression dives to a maximum depth of 130 fsw. During the course you'll make 4 dives on one weekend at Lake Tahoe. 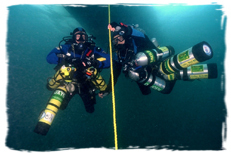 This course is your first step toward the Decompression Procedures Course and Trimix diving. Group of 2 or more $500.00 per diver. Course is limited to 6 divers. This course examines the theory, methods and procedures of planning stage decompression diving. In the program you plan and conduct 4 standard stage decompression dives to a maximum depth of 150 fsw. The class includes information on the most common equipment requirements, gear set-up, decompression techniques, and accelerated decompression mixtures including nitrox and oxygen. Group of 2 or more $600.00 per diver. Prerequisite: Advanced Nitrox Diver and 25 logged open water dives. Course is limited to 4 divers. This course examines the theory, methods and procedures of planning stage decompression diving at the maximum air depth. In the program you plan and conduct 4 standard stage decompression dives to a maximum depth of 180 fsw. 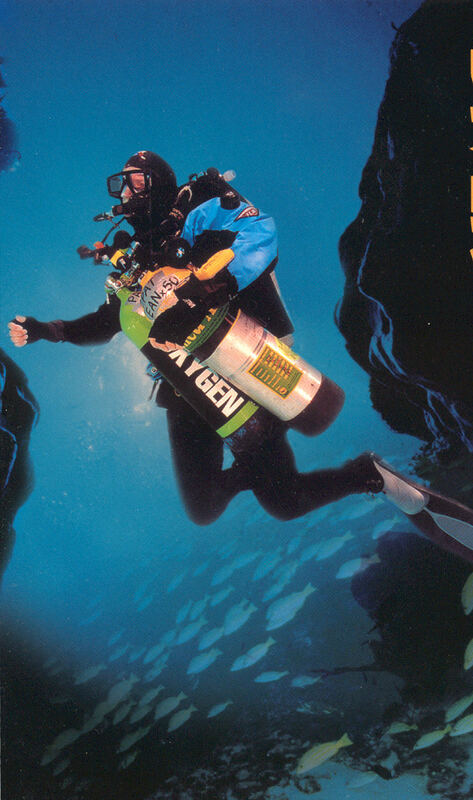 The class includes information on the most common equipment requirements, gear set-up, decompression techniques, and accelerated decompression mixtures including nitrox and oxygen. Group of 2 or more $900.00 per diver. Prerequisite: Age 18, Decompression Procedures Diver and 100 logged open water dives. 25 dives logged over 100 fsw. and receive a discount price. The Entry Level Trimix Course will provide you the training required to competently and safely utilize breathing gases containing helium for dives that require staged decompression. During the course you will learn about the benefits, hazards, proper procedures and equipment utilized in making oxygen/helium/nitrogen mixture dives. 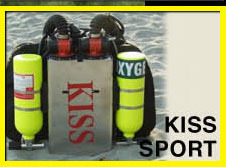 You will make 4 open water dives using trimix and nitrox/oxygen decompression gases. This course qualifies you to a maximum depth of 200 fsw. Group of 2 or more $800.00 per diver. Prerequisite: Advanced Nitrox, Decompression Procedures, 100 logged open water dives. The Advanced Trimix Course will provide you the training required to competently and safely utilize breathing gases containing helium for dives that require staged decompression. During the course you will learn about the benefits, hazards, proper procedures and equipment utilized in making oxygen/helium/nitrogen mixture dives. You will make 4 open water dives using trimix and nitrox/oxygen decompression gases. This course qualifies you to a maximum depth of 300 fsw. Prerequisite: Advanced Nitrox, Decompression Procedures, Entry Trimix, 100 logged open water dives. The TDI Nitrox Blender course will train you to become a competent and qualified gas blender, allowing you to provide gas mixes to appropriately certified consumers. You will learn the physical properties of oxygen, its associated hazards, handling requirements and what cleaning equipment is necessary. Finally, you will learn the five methods of obtaining the desired enriched air nitrox mix. Group of 2 or more $125.00 per diver. The TDI Advanced Gas Blender course will train you to become a competent and qualified gas blender, allowing you to provide gas mixes to appropriately certified consumers. You will learn the physical properties of oxygen, its associated hazards, handling requirements and what cleaning equipment is necessary. Finally, you will learn the five methods of obtaining the desired enriched air nitrox mix and the various methods used to obtain proper helium mixes. Group of 2 or more $165.00 per diver. Prerequisite: Nitrox Diver, TDI Nitrox Blender, 18 years old. The DSAT Gas Blender course will train you to become a competent and qualified gas blender, allowing you to provide gas mixes to appropriately certified consumers. You will learn the physical properties of oxygen, its associated hazards, handling requirements and what cleaning equipment is necessary. Finally, you will learn the five methods of obtaining the desired enriched air nitrox mix and the various methods used to obtain proper helium mixes. Group of 2 or more $195.00 per diver. Prerequisite: PADI EANx Diver or equivalent. 18 years old. Group of 2 or more $200.00 per diver. Prerequisite: PADI EANx Instructor or equivalent. 18 years old. DiveAssure makes available to the recreational diving community insurance protection during diving activities. Also available is Diving Equipment and Great Travel Insurance.